S. Arutchelvan made comments on the 'anti-PTPTN and Free Education' action of a group of disillusioned students, which could hardly be acceptable (refer media statement released by FOS Working Committee on 19 May for details). [Editor's Note] This article is from the Secretary-General of the Socialist Party of Malaysia (PSM), S. Arutchelvan in response to the media statement entitled "428 Sit-in Protest - Its implications and positive significance" released by Friends of Suaram (FOS) Working Committee Johor on 19 May. 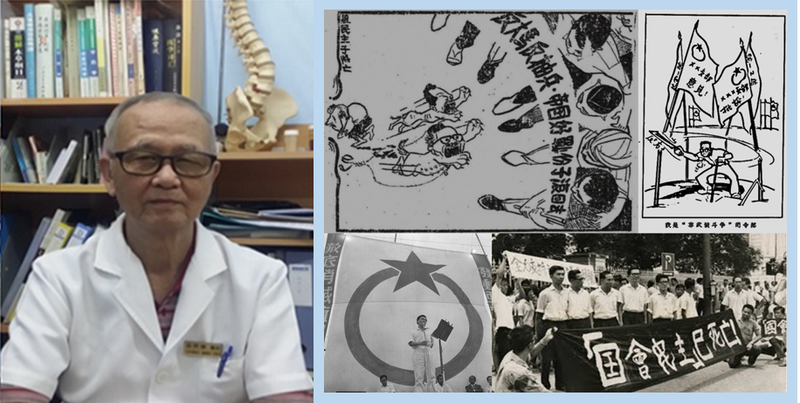 As per email request from S. Arutchelvan, FOS Working Committee Johor decided to post the response article on this blog, for the benefit and reference of readers. When Arul's response article is published on PSM's website, FOS Working Committee Johor does hope that our full media statement released on 19 May would also be published together, for the study and comparison purpose of readers. 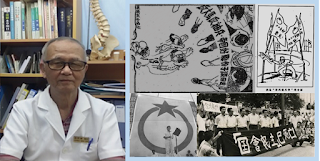 I would like to respond briefly on the Statement made by Friends of SUARAM working Committee dated 19 May 2012 : 428 Sit-in Protest- Its implications and positive significance Statement by Friends of Suaram Working Committee . I refer to the following comments which has been singled out by the committee in a dramatic way which I find it to be malicious and out of context and does not gel well with the other parts of their analysis. “Few may realise that the student 'anti-PTPTN and free education' rally on 14 April 2012 is going to be a significant event, … the students declared that they were going to stay put or occupy Merdeka Square up to 28 April, to greet BERSIH 3.0; the Student occupy movement seems to brighten our days leading to BERSIH 3.0.” (Note: “our” here refers to Arutchelvan and those who advocated “Occupy Merdeka Square”). 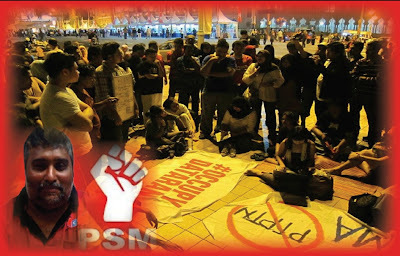 The obvious mistake made by this PSM leader and the supporters of “Occupy Merdeka Square” was that they regarded as truth what they had observed, as if the public shared their views, and was prepared to act on them. This is an effort in futility! Despite their good intention to merge both the May Day Celebration and the students' “Occupy Merdeka Square” rally into one, for the purpose of liberating the Merdeka Square, it came to naught. Let me first clarify that the observation made by the Johore Friends of SUARAM not only does not paint the right picture of the actual situation leading to BERSIH3, it totally ignores what really took place in KL. It seems that the Committee who are based in Johor completely did not get the right scenario on what was happening in Kuala Lumpur on how this student’s action did motivate many people. When BERSIH announced Bersih3, there was a sense that it was not catching fire and this is also due to the lack of reaction from the mainstream media as well as the police. Most people including the BERSIH steering Committee were very worried. Everything seem to change when hundreds of students (not dozens) marched in Kuala Lumpur calling for free education. The students numbering between 500 to 800 went all round KL in a spirited manner. It was not a bunch of Malay but a there were students from different races who marched in Kuala Lumpur and declared that they will stay put until Bersih3. The first person to get excited and release a sms to all groups were Hishamuddin Rais who was in charge of the mobilisation committee of BERSIH3. So the BERSIH3 steering committee indeed did see the student as an important catalyst to the huge mobilisation leading to BERSIH3 unlike the FOS group in Johor. Every night there were ceramahs attended by hundreds of people at Dataran Merdeka. The numbers kept increasing by the day until April 28.This really built the mood and the spirit towards BERSIH3. Besides that, these student leaders also went all over the country during this period to talk about their role and to urge the people to come to Dataran Merdeka on 428. I think the Suaram Johor FOS is perhaps confused with another group which is called Occupy Dataran whose picture is posted in their story. This group also played a significant role but I was talking more about the students who occupied Dataran. The student’s actions definitely did built the momentum leading to BERSIH3. In a big gathering in Kampong Baru a few days before BERSIH3, attended by many political party leaders and NGO leaders including Samad Said. Each and every speaker spoke about the bravery of the students including Pak Samad who urged everyone to attend the BERSIH3 rally. The student leaders also got tremendous applause each time they spoke. They brought fresh spirit to BERSIH3. In ceramahs leading to BERSIH3, the students brave move to occupy Dataran was used as an example for others to come and attend 428. So the students action was admired by many and who came to support them. The numbers of people gathering every night at Dataran was increasing by the day, the students themselves played a role and were taken all over the country to rally support and many used them to motivate others to come. So definitely their action is not isolated in a small square as being portrayed by the article by FOS. The students created such a momentum that it even people like Anwar Ibrahim, Kit Siang and Muhamad Sabu and many other key political leaders found their way to Dataran Merdeka to support this initiatives. If the students role were so insignificant, I do not see why so many significant people took time off to support them. It is my believe that many young people who attended the BERSIH rally actually support the students and got motivated by the students. I think the public in large shared the aspiration of the students. Using the new social media, young people are well connected via facebook and twitter. Therefore our views (PSM) and feeling were always grounded with the real situation on the ground. What the students did was just to built momentum but they cannot take the credit for the whole success of BERSIH3 where many other factors are involved. I think for FOS to suggest PSM has a grand plan or design to detour the original BERSIH plan is a bit farfetched and a bit mischievous. When I mentioned that the students raised the bar in our democratic struggle, it seems there is yet another confusion by the FOS working committee. Prior to the students demonstration, most people in Malaysia normally have demo for a few hours and disperse. This has been the trend in recent years. The students have raised the bar because they wanted to stay longer and it was now a protracted struggle because they said they wanted to stay put. This is what I meant by raising the bar. There has been many discussion among groups that the level of people participating in struggle have yet to reach the height in Thailand, Indonesia and recently in Egypt where people stay put for a long period of time. Here it is nothing like that but the Students have put a challenge to new groups. Their method was an anti thesis which should not be taken lightly. What I said should be seen in that right context and should be properly understood and interpreted by the FOS rather than taking a hastily put conclusion on what I said. Since the students have occupied, I am now seeing more groups are seeing demonstration as not just a few hours activity but rather a protracted struggle. Recently Paycon workers took similar steps and wanted to stay until they meet the Human Resource Minister. While I write this article, there is a group camping at the fountain at Brickfields in a hunger strike and it is day three and in the coming days, the Bukit Jalil plantation workers are also planning to occupy the Prime Minister office.Therefore the student action has created a new challenge to groups who want to conduct demonstration. Credits should be given to the students who have raised the standards. They have made many Malaysian especially young people come to 428 as well as made many people think. Having said that, PSM has always taken the position of peoples movement and we were very much involved in mobilisation as well as leading the BERSIH 3 movement. Just because PSM gave credit to the student movement, It is quite malicious for FOS to portray and say as if PSM believes in small group action or we read the situation wrongly. On for the record, there was lots of coordination between the BERSIH committee and the May day committee. The May Day committee at all times felt that BERSIH Committee being the biggest democratic movement in the country should call the shorts. So any conspiracy theory being said by FOS is totally false and does not reflect what happen on the day. The BERSIH committee on 428 decided not to break the barricade. This was a collective decision. My view has been if a vote was taken, people would have agreed to get into Dataran Merdeka not in the intention to occupy it but rather to prove peoples power. If the leadership of BERSIH decided to move into Dataran the other day, they would have achieved this but because that was not part of the plan, it was not executed. PSM mobilised buses of people on that day. Never did we tell our people to bring tents to Dataran because that was not the plan. Never did the party issue any directive such as that. Being involved in mass movement work, we are not so naive on objective and subjective conditions. Dataran Merdeka will definitely be liberated in the future. Syabas to the young students who played a significant role in building the momentum to BERSIH3. A movement cannot be built in an abstract situation and there are many factors leading to it. Our role is not merely to interpret the world but rather to change it. An interview with Ambiga:Bersih 3.0, What's Next?